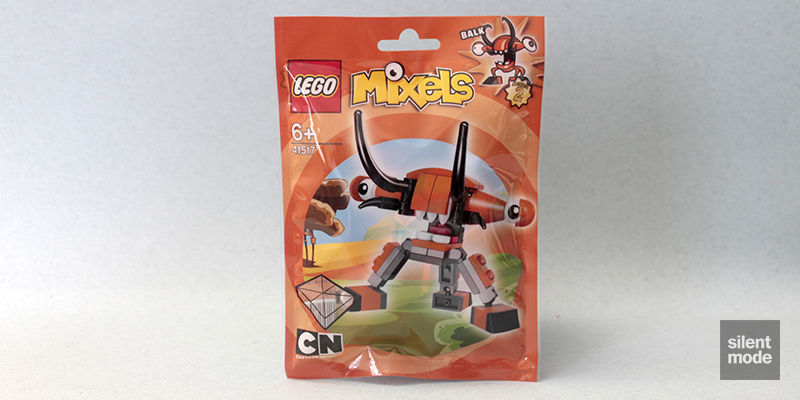 Here it is: the last Mixels Series 2 review , and our last study of the Flexers tribe. We end this run with a look at Balk: probably the most uninspired name for a Mixel thus far. The unusual shape of this Mixel is what grabs our attention, but from here it doesn’t look that interesting. Let’s take a closer look. Well there are certainly a lot of interesting parts in this set, as shown in this photo. The star of the show (for me personally) is the presence of three 1×1 round tiles in White, of which I don’t have any let alone enough. 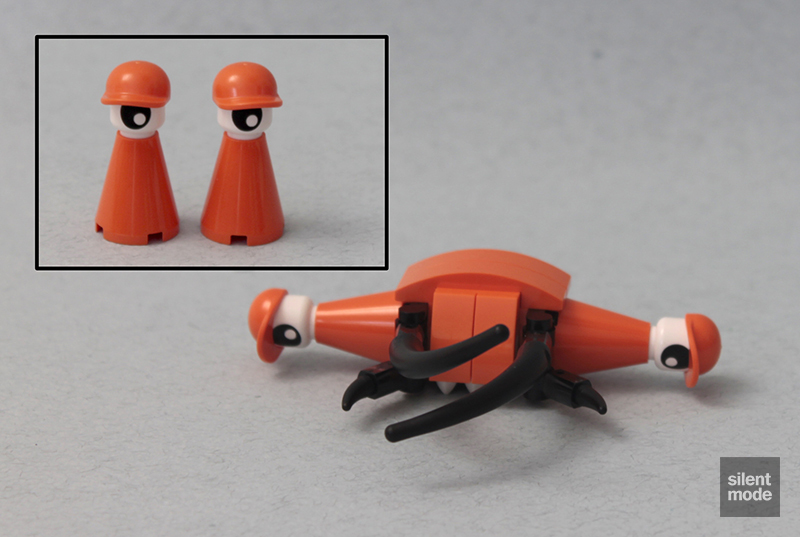 We also have two more of those eye minifigure heads in White, and three each of the ball and socket joint plates. We also get the most bar holder parts (bottom left) of the Flexers in this set, and even a pair of new-style Orange minifigure caps..? Immediately two of the 1×1 round tiles are used to act as teeth when building the “core”. You’ll also notice those dreaded stepped hinge plates being used again, or which there are three: this is a three-legged Mixel. And here are those three legs, which are all identical. These are where those fabulous joint parts come into play. All that’s left is to put the ginormous head together, which is a small feat of SNOT work. 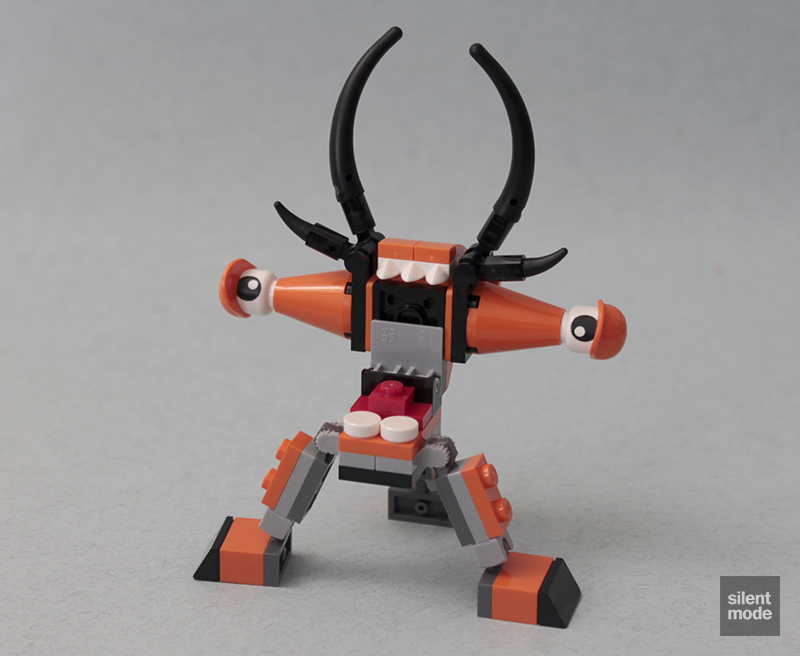 Much like with Slumbo, minifigure heads and headwear combine to create a huge pair of eyes. The head is also finished with two sets of appendages, all held together using the bar holder parts. Balk demonstrates it has a big mouth too, though not nearly as big as Kraw. 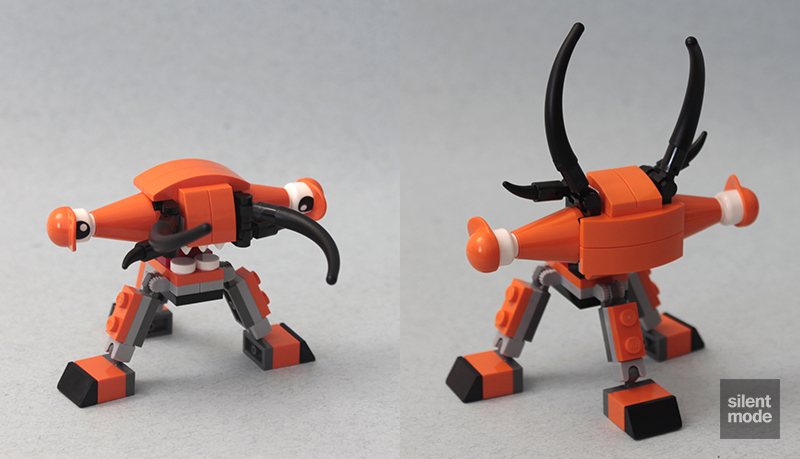 So here we have Balk: part squid, part stag beetle, all-powerful Mixel. 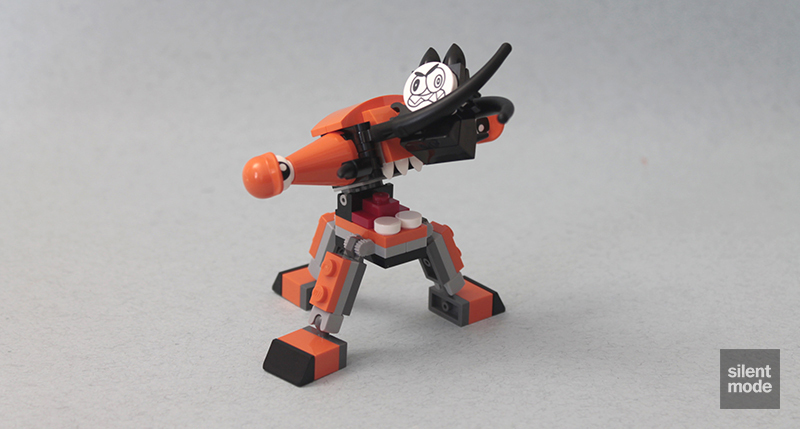 It likes to stand its ground and engage Nixels – and perhaps even other Mixels – in a test of strength. BALK might be the slowest of the Flexers tribe, but this Mixel’s mallet-like head can hit, pummel and crush whatever gets in the way. All that head-butting has bashed BALK’s brain cells, so this hammer-headed Mixel can be forgetful and find it hard to spit out the right words. But there’s no one better to defend the Rubberlands, where the Flexers live, from Nixel invasions. As you might have guessed, Balk comes with this tribe’s very own Nixel – and this one has clearly been tormented. Balk is actually the first third-in-line Mixel to come with a Nixel. How does Balk show its appreciation? By squeezing the ever-loving studs out of it, of course. Oh good, a spare 1×1 round tile. Otherwise there’s not much to see here; move along. I’m not sure about this Mixel: it’s a good enough build and comes with a nice assortment of parts, but as a completed set it’s best to have it as part of a collection (i.e. with other Mixels). Much of this set’s worth is due to having the tribe’s Nixel included. One thing I will say is this is one Mixel where the stepped hinge plates come in handy. 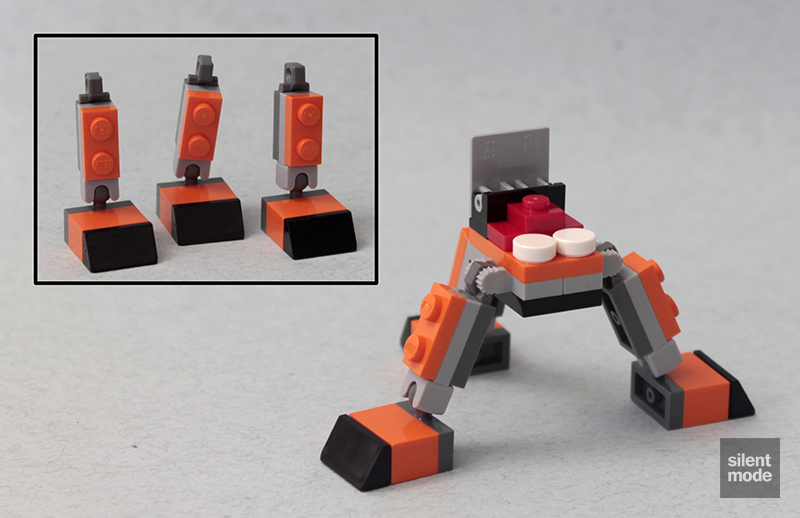 I don’t know about you, but Balk is more of a “stand its ground” than a moving around Mixel, and the stepped hinge plates make it easy to pose it that way. I’m going to give this one 6.6/10.